The note will feature the image of Sir Winston Churchill and will be made of plastic rather than cotton paper. 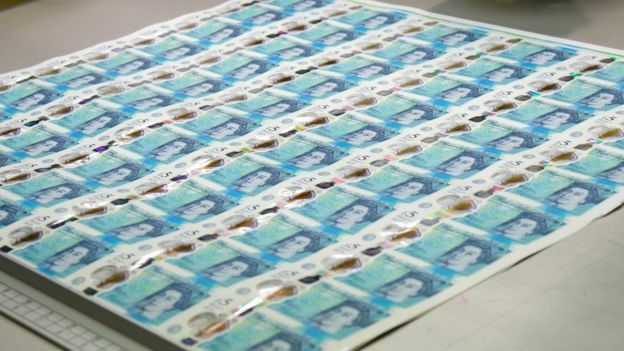 The Bank says the thin and flexible plastic banknotes will be cleaner, more durable - as they will last for five years - and harder to counterfeit than the current paper notes. It admits that they may initially be prone to sticking together. The use of thin, see-through polymer is a first for the Bank of England, which invested £70m in the project. Plastic banknotes are already in use in Scotland as well as other countries including Australia and Canada. They have also been used in Northern Ireland. At an event at Churchill's birthplace of Blenheim Palace in Oxfordshire, the Bank is also releasing advice to businesses about dealing with the new polymer notes, which are 15% smaller than the current notes. Brendan Doyle, of CMS Payments Intelligence, said: "Retailers and banks are going to have to invest over £200m to change ATMs, self-service checkouts and other equipment." The decision to feature Churchill on the new banknote was made three years ago. Bank governor Mark Carney said: "Our banknotes are repositories of the United Kingdom's collective memory and like Churchill, our new polymer notes will stand the test of time." The new design includes a see-through plastic window featuring the Queen's portrait. The new notes will also feature holograms - such as one showing the maze at Blenheim Palace - and micro-lettering beneath the Queen's portrait with letters and numbers that are visible under a microscope. Various elements such as size and colours are aimed to assist people who are visually impaired. The image of Churchill has featured on currency before. He was the first commoner to be shown on a British coin when he appeared on the 1965 crown, or five shilling piece.